Once you have chosen the desired place for your Pooja room according to Vastu, you can now begin gathering décor ideas. Interior decoration is guided more by personal perception than is readily accepted. 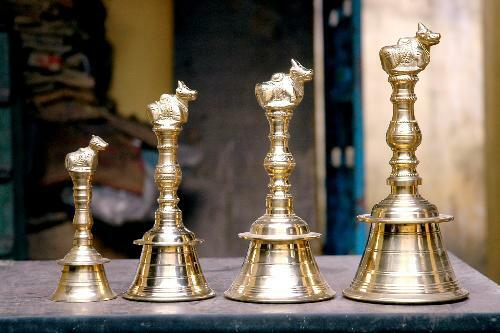 So even though metal mandaps may be the ‘in-thing’, you may want to opt for a sandalwood or teakwood. Traditionally, Pooja mandaps were made of wood and even today most homes prefer to have a wooden mandap in the Pooja room. 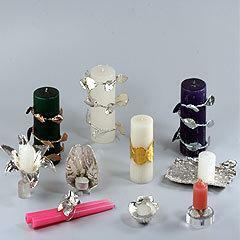 Once you have decided on the material, the choice of designs, manufacture and decorations can be overwhelming. 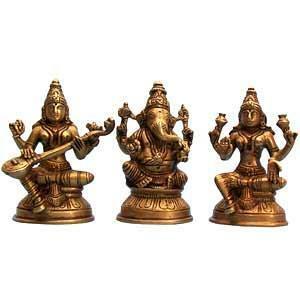 You will find all sorts of sizes, shapes and carvings to suit every budget and every room size. 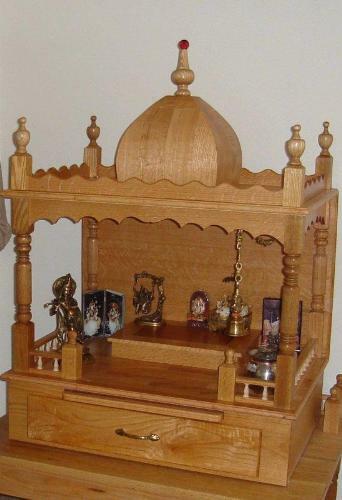 You could check for a Pooja mandap at a local furniture shop, visit our website or even have a carpenter craft a unique one for your Pooja room. However, in the lack of skilled labor in your vicinity, the former options are widely followed. 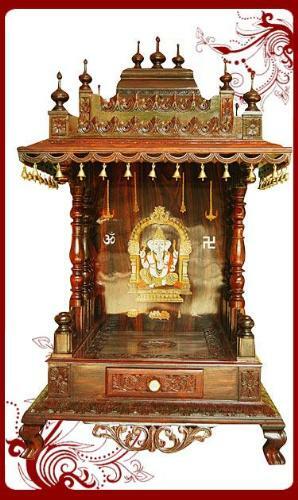 With the Pooja mandap in place, you could choose light weight idols in wood or metal. Some homes use beautifully painted clay idols that you could touch up on your own with some imagination! 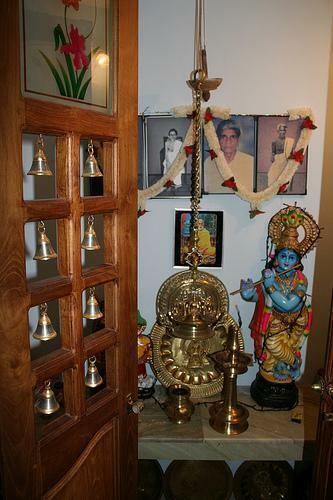 Alternatively, chrome, silver or wood framed photographs of deities could beautifully adorn the Pooja room as well. Shop at your local Pooja shop for miniature garlands made of pearls and colorful beads. If you have the skills, it could be a fun holiday activity for children to make these out of loose beads and jewels. 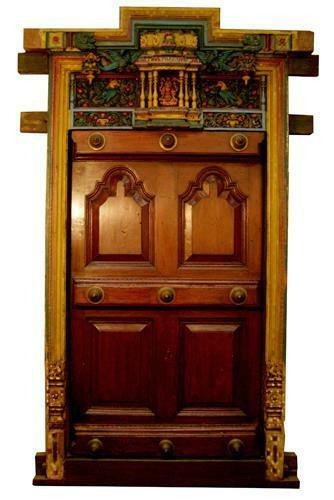 Instead of hanging bells in the Pooja room (Vastu recommends that you do not use them), you could instead opt for carved doors made from wood. Most of these have small see through sections that have wooden/ brass bells hanging in them tingling melodiously every time you open and shut the doors. Flea markets around festival times see a lot of Pooja items being sold at every neighborhood shop. You can go through these shops to pick up small items both for practical use as well as decoration for the Pooja room. 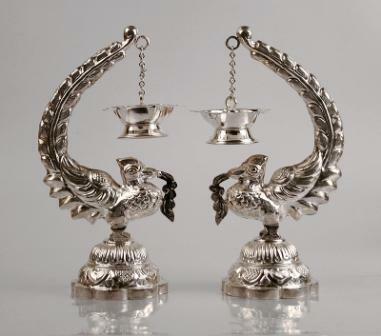 Traditional metal “thalams” and other utensils in silver or gold plating can look very appealing. Incense stick holders come in all sizes, shapes and materials; changing them for every festive ocassion can change the look of your Pooja room altogether. Your Pooja room could be a combination of exclusive items and handmade ones but the décor must be one of harmony, peace and devotion. Choose the right kind of decoration for your own abode of Gods and do not forget to add fresh flowers each day. 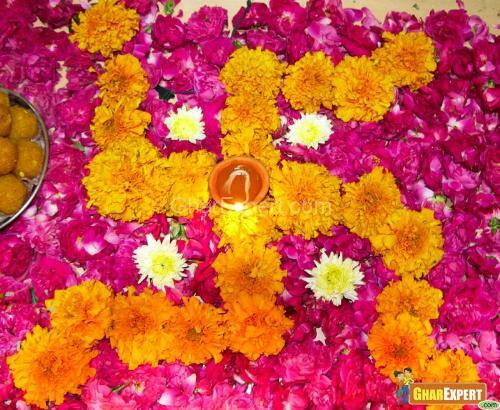 Vastu governs positive and negative energy inside the house. Positive zones such as east, north and north-east give us positive energy for working. These zones should be used for pooja room in the house.